Mr. Son is laughing. He’s walking from bench to bench at our Fremont shop, talking to assemblers and making sure they have everything they need to get the job done right. There are times where he stops and listens earnestly. He checks drawings, looks at the assembly, asks a couple of questions, and then makes a gentle suggestion. Mr. Son — his full name is Son Doan — has worked in Silicon Valley for more than 25 years. He’s been an assembler, quoter, technician, and now is a production supervisor and trainer. That breadth of experience helps him in his current role. One of the tenants of Compass Made’s culture is building up our employees by providing the education, skills, and tools they need to succeed. Mr. Son anchors the company’s commitment to its employees, bringing in his professional capabilities and knowledge to the job every day. Originally from Vietnam with a background in chemical engineering, Mr. Son came to the United States with a basic understanding of electronics and a desire to support his family. He picked up the ins-and-outs of the industry quickly, as each position he took on expanded his practical experience in the manufacturing process. Beyond teaching is motivating. There are dozens of styles, from the screamer to the coach. Mr. Son smiles when asked what style he uses. In addition to helping Compass Made employees, Mr. Son has been a force for improving the company’s training programs. In his early days, the company was reactionary when a problem arose. Now, there are regular meetings to look at what’s happening and what can be improved and regular training. 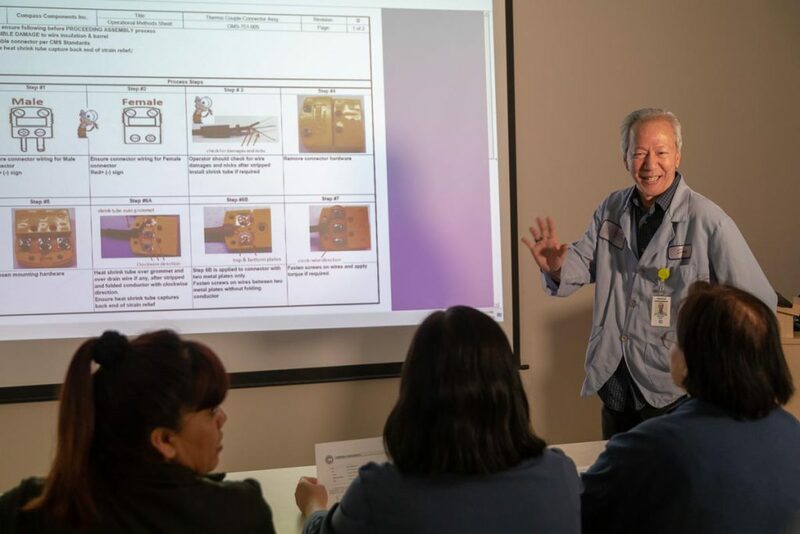 One of the more recent examples of how things have changed and how people are learning at Compass Made is the integration of Plug One Test One (POTO) at the company’s manufacturing plants. Not only is POTO finding problems early, but it’s also helping the team to understand why they’re making a mistake. Throughout his lengthy career, Mr. Son has witnessed the evolution of the industry and Compass Made. These days, in contrast to 20 years ago, he observes that there is more precision in the manufacturing process because a computer database can deliver technical information in seconds rather than the assembler having to look through dozens of pages of data in a manual. Testing and quality assurance have also taken a huge step forward, he reports. Twenty years ago, when the industry made 100 cables, up to five were rejected by the customer. Today, he only sees one cable rejected by the customer out of every 2,500 cables. Outside of the office, Mr. Son is a loving husband, father of four, and grandfather of two, who cherishes spending time with his family. One of his sons recently graduated college and works for a design company, while his youngest son started his first year at the University of California at Irvine. His eldest grandson will be attending a university this fall. Mr. Son sits up and looks around. He’s been talking about himself for 20 minutes or so. It’s time to get back out on the floor and find someone to help.